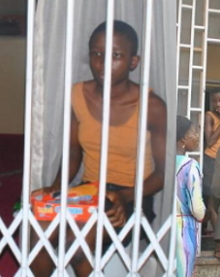 Meet 13-year-old Oseh Nkechi, a young maid rescued by Lagos Police from the house of her boss in Lagos yesterday weeks after she was locked up. According to Lagos State Police Commissioner, Edgal Imohimi, Nkechi was rescued at House Number 30 Adeniran Ajao Estate in Anthony village, Ikeja Lagos. 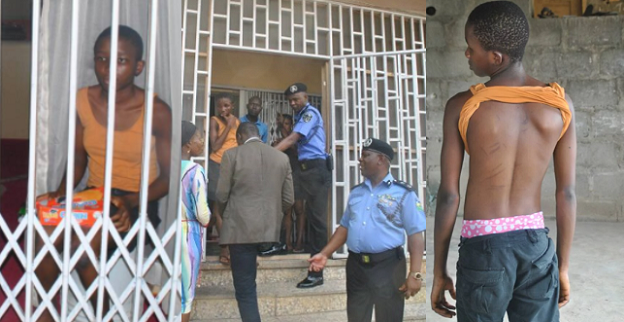 Police stormed the house after receiving a tip off from a neighbour , Betty Ifeoma who said Nkechi was locked up by her boss who left her with two boxes of cabin biscuits before she travelled out of the country to London for vacation. Since her uncle brought her to Lagos from Igboju in Delta state, Nkechi who lost her parents when she was a baby has been subjected to series of domestic attacks. Here is what she told police after she was rescued on Wednesday. She has been placed under the care of Lagos state Ministry of Youth and Social Development. What is this world turning into? Yet this kind of woman will be the one throwing money all over the place like a saint. Cabin biscuit for what na?! the woman should receive should be jail for life. The worst of all is that when she comes back she will visit one of this big pastors for thanksgiving service, after all these evil, how can God help Nigeria? HOW CAN God answered our prayer while we commit the worst sin in the surface of earth .An Orphan, you locked her up with Ordinary biscuits God will judge all of you. This Lucifer deserve to be caged for life with hard labor. No parole.